Listen to Episode 13 of MN GhostBox Now! On October 21st we had a great conversation with Chad Stambaugh. 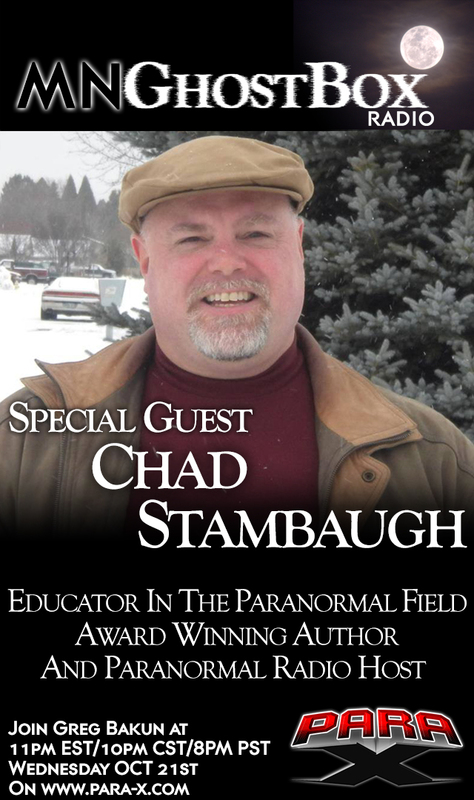 Chad Stambaugh is a Paranormal Educator. That is among a lot of other things he has accomplished. Because of his strong advocacy for more education in the paranormal field, he’s created a complete new training series of DVD’s; Paranormal 101, 102, The Paranormal Safety and Paranormal Ethics. All sold on Amazon. Chad has started his own Educational Radio Show, The Paranormal Round Table. Greg Bakun of MN GhostBox made a guest appearance on a few weeks back. It can be found HERE if you would like to listen. The Paranormal Round Table is on every Thursday at 8pm EST/7pm CST/5pm PST. * The IPAA Award (The International Paranormal Acknowledgement Awards) The IPAA is a special award based on the hard work, focus, personal merit and dedication to the field of the paranormal. Chad is the second American to ever win this award. It’s a great show with lively conversation about his background of how he got into the Paranormal and what he and his team does on investigations and their general ideology on Paranormal Investigations. Check it out! If you want to listen to previous episodes of MN GhostBox radio, you can do so on or Para-X Radio Page. This Wednesday is an all-new episode of MN GhostBox on Para X Radio​. This week we will talk with Kristin Lee. Kristin is the owner of the incredibly active Bellaire House in Ohio. Kristin has been seen on My Ghost Story. After having renters in the house a little over a year, they couldn’t handle the activity any longer. Those were the longest to have ever stayed. The house is now re-opened for people to investigate for themselves. The house sits on a Leyline- native burial, coal mine, and the Ohio River. People have been pushed down steps, held down to bed, things have moved by themselves, a dog was thrown across the room. The history behind the house is horrible. Kristin will be on the show to tell us what has been happening there. MN GhostBox is on this Wednesday at 11pm EST/10pm CST/8pm PST on www.para-x.com. Don’t miss it! Greg was honored to be asked to be a guest on The Paranormal Round Table hosted by Chad Stambaugh. This series is found on the ParaSpeak Radio Network. www.paraspeakradio.com. This was a fantastic program with Chad and Greg speaking extensively about the spirit box and how it is used. Greg opened up in great detail about how he prepares himself for an investigation using the spirit box and what he does mentally to get ready to communicate with spirits. This hour-long show goes by very quickly and Greg hopes that Chad had as much fun with the interview as he did. Click here for to listen to the episode. Check out other radio appearances of MN GhostBox HERE. This Wednesday is an all-new episode of MN GhostBox on Para-X radio. This week we will talk with Chad Stambaugh. Chad is an award winning author and recently his own radio show, The Paranormal Roundtable, had been named Paranormal Radio Show of the year. We will find out more of what that means and talk with Chad about his DVD training series educating people on the Paranormal and Paranormal investigating. This will be an educational and fun show that should not be missed. MN GhostBox is on this Wednesday at 11pm EST/10pm CST/8pm PST on www.para-x.com. Don’t miss it! 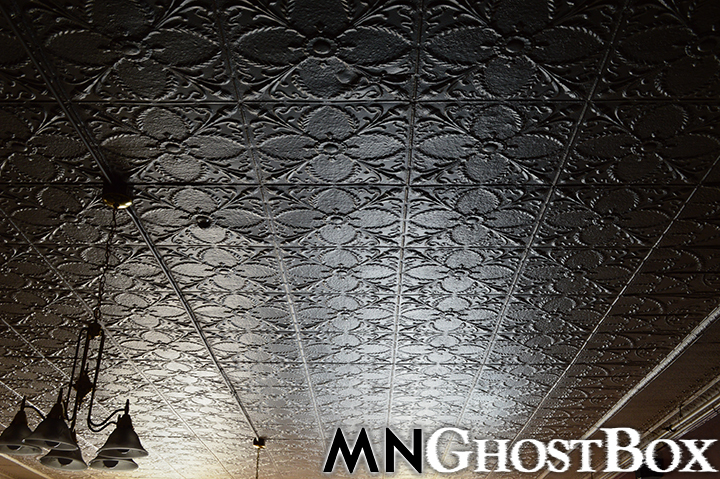 We are extremely excited to be shooting our third episode of the MN GhostBox web series tonight at this location. It’s definitely a number 1 location! Listen to Episode 12 of MN GhostBox now! 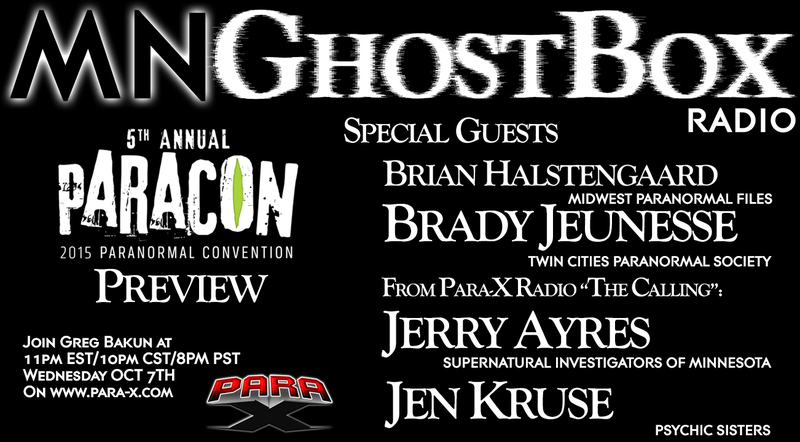 ParaCon may be over but that doesn’t mean this episode of MN GhostBox from October 7th is out of date. With some of the most talented Paranormal Investigators and Psychic Mediums in the field in this episode, why wouldn’t you want to listen to what they think about ParaCon and the Paranormal field in general. Not only was it a fun episode but a very informative one too. Here’s your chance to play it below. Did you go to ParaCon and want to give your story on what happened over the weekend? Feel free to do so in the comments section. If you want to listen to previous episodes of MN GhostBox radio, you can do so on or Para-X Radio Page. How exciting! 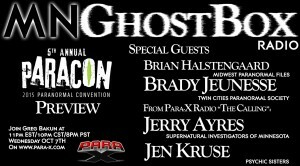 In mere days I will go to my first ParaCon! What do I do? What should I stay away from? Any fun gossip? And most importantly, where is the bar? I have assembled some awesome para-peeps for this week’s installment of MN GhostBox to answer these questions. The list of special guests include: Jerry Ayres from Supernatural Investigators of Minnesota, Jen Kruse from Psychic Sisters (both Jen & Jerry host The Calling on Para-X too), Braden Jeunesse from Twin Cities Paranormal Society, and Brian Halstensgaard from The Midwest Paranormal Files. Greg and Nicole will be at ParaCon this year in Mahnomen MN and they couldn’t be happier. Although they won’t have a booth this year, they will be making their way around the convention meeting people and passing out cards. If you will be attending the convention and want to say hi, feel free to e-mail us before the convention or send us a tweet. We are @mnghostbox.